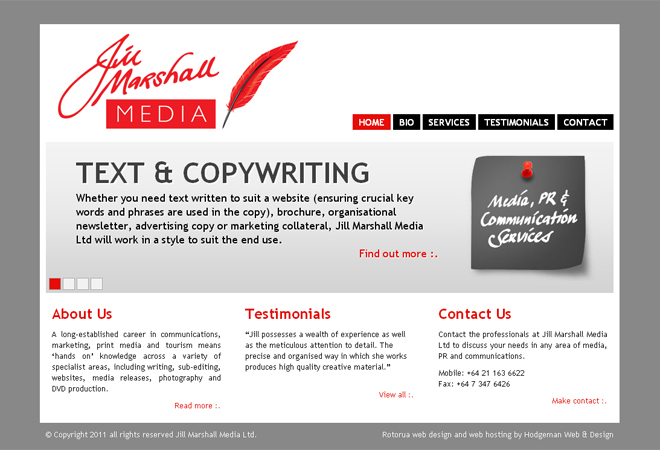 Jill Marshall contacted us wanting a minimalist, professional website to promote her new media, PR and communication services company. Using the logo artwork that was created by Nick Lambert from ZeroSeven, we created this layout that kept the content at the forefront and focused on showcasing Jill’s services. Jill wanted the ability to edit the site herself so we built the site on the powerful Content Management System (CMS) WordPress and created this custom WordPress theme based on the concept we designed. Got a new business that requires a professional online presence? Contact Hodgeman Web & Design today and we’ll create something unique for you and your company that gets you noticed.